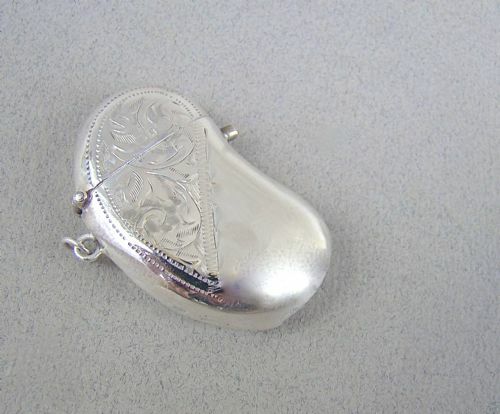 This exquisite Novelty Edwardian silver vesta case is in the form of a bean. Both front and back partially engraved with foliate scrolls. The front with a push button opening the sprung hinged cover. The side fitted with a suspension ring. The base with textured striker. Date letter "g" for 1906. Spring mechanism in full working order. A fabulous addition to a collection. 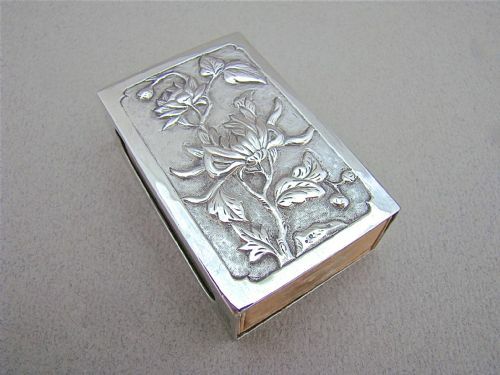 This exquisite medium-sized Chinese Export silver matchbox cover is very naturalistic, which dates it dates circa 1875. The front beautifully embossed with peonies on a very fine spot-hammered background. Its size means it was probably destined to sit on a desk. Still retains a matchbox with wooden matches. Length: 6 cm - 3 inches. Width: 4cm - 2 inches. Height: 2 cm - 0.6 inch. This charming medium-sized silver matchbox cover is dated Birmingham 1900 and was made by the prolific Crisford & Norris. The front embossed with foliate scrolls surrounding a vacant reserve. Its size means it was probably destined to sit on a desk. Still retains a matchbox with wooden matches. C&N for Crisford & Norris. 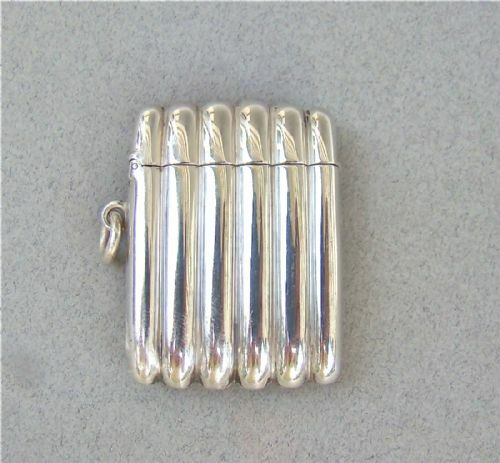 Victorian solid silver cigar cases are very sought-after and this is a fine example. Of conventional lobed rectangular form, the plain fluted body with front catch opening to reveal a bright gilt interior. It has a very good gauge of silver and feels satisfyingly heavy. Date letter "e" for 1897. Weight: 120 g/ 4.2 oz. Catch mechanism in full working order. This fabulous and very unusual solid silver and dark blue enamel tinderbox bears the marks of Georg Adam Schied, reputed Austrian silversmith from the mid 19th Century. The vesta is enamelled on the front, the back and all sides. It comes complete with the original tinder wick. 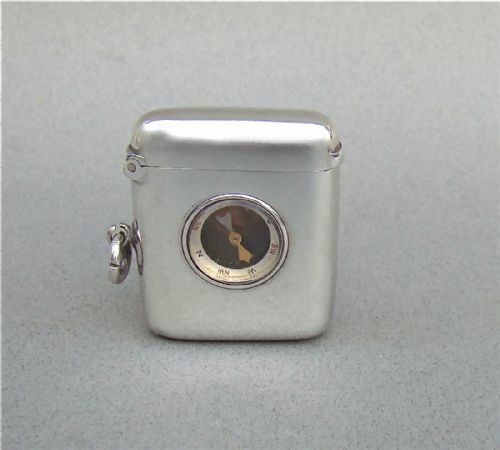 The lid of the case has a recessed hinge displaying superb workmanship.The right-hand side incorporating a hinged lid compartment with chain attached to the cord to operate its movement within the vesta. The back of the vesta with striker. A fabulous and extremely rare collectors' piece. The inside bears the makers mark "G.A.S." (George Adam Scheid) and the hexagonal lozenge mark with Diana head and a "2" . Enamel in very good condition. No chips , minor surface wear, commensurate with age. 2.2 inches x 1.2 inches. 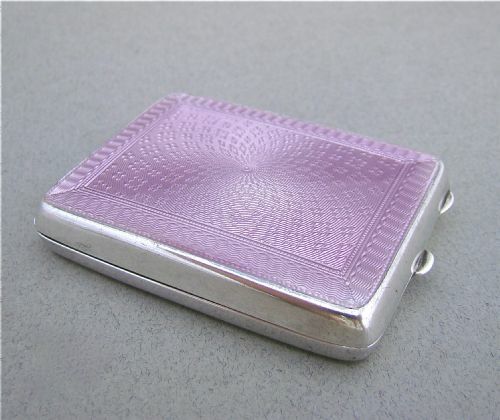 This fabulous silver & pale lilac guilloche enamel match book case is dated Birmingham 1928 and was made by the celebrated Henry Matthews. It has an elegant rounded rectangular form. The front with a stunning guilloche enamel cover. 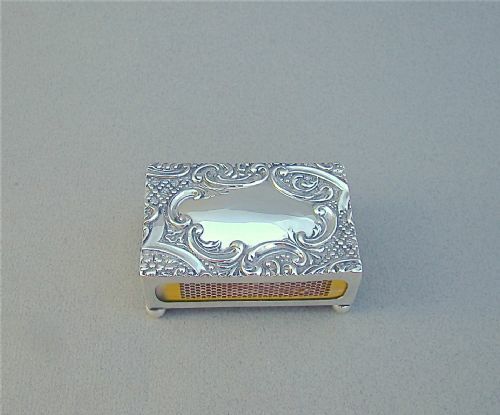 It has two silver thumb pieces facilitating the opening of the case. The interior a pale gilt. Date letter "D" for 1928. Enamel in very good condition. Minor ding at the back, barely noticeable. 2.2 inches x 1.4 inches. 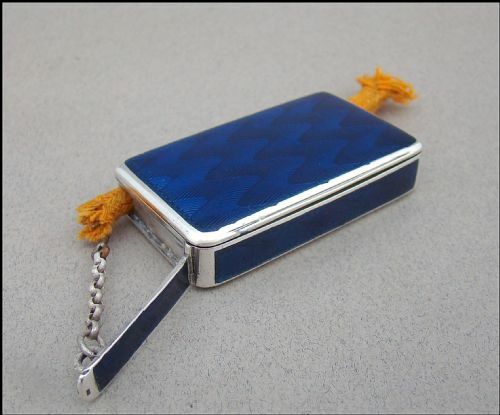 A Victorian Silver Vesta Case with a gilt & enamel compass inset into the front of the case. The case has a hinged lid. Fitted with a jump rind. A&J Z for A&J Zimmerman Ltd. Date letter "W" for 1896. 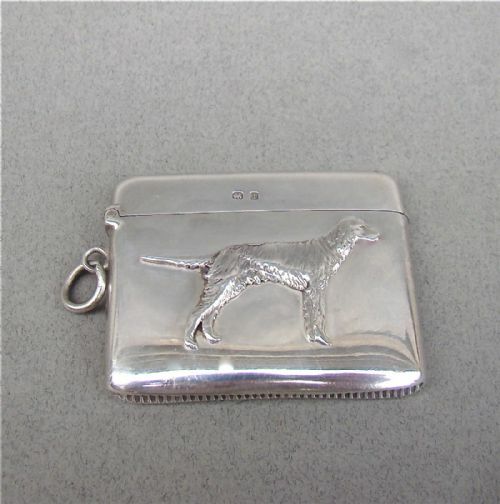 This is a rare and beautiful Edwardian solid silver vesta case. Of circular form, the right side applied with a crescent moon. Opening to reveal a gilt interior. Date letter "f" for 1905. Diameter: 5cm / 2 inches. 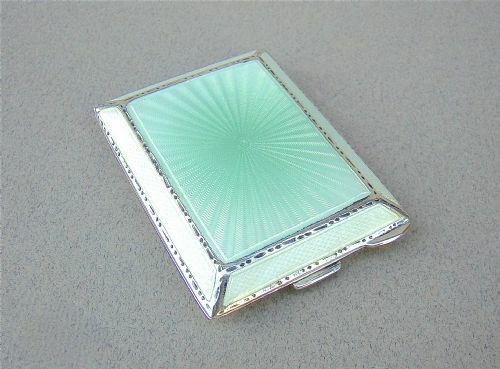 This fabulous silver & pale green guilloche enamel match book case is dated Chester 1939 and was made by the celebrated Walker & Hall. It has an elegant tapered rectangular form. The front with a stunning guilloche enamel cover graduating from pale green to cream. The enamel panels within decorative silver borders. 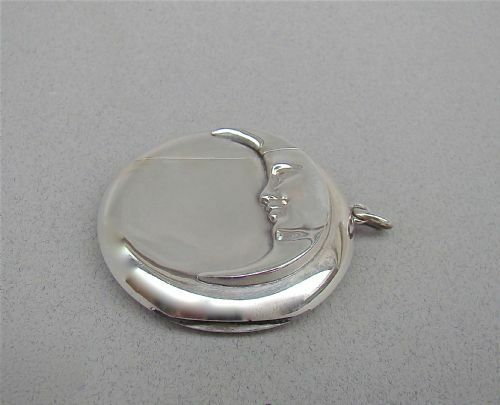 It has two silver thumb pieces facilitating the opening of the case. W&H for Walker & Hall. Date letter "O" for 1939. Enamel in good condition, no chips or loss but some surface scratching. 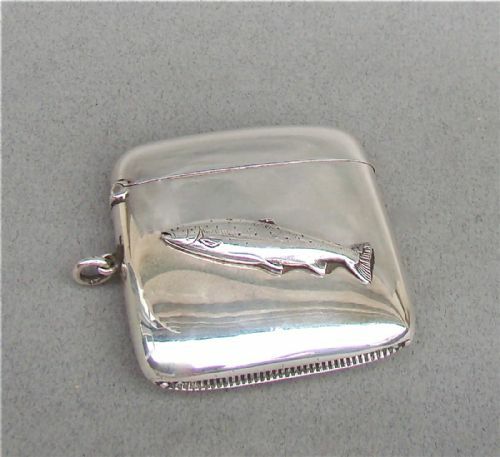 This is a unique and wonderful solid silver vesta case. Of rounded rectangular form, it is applied diagonally with a naturalistic fish. R.B.S for the Rolason Brothers. Date letter "m" for 1911. Date letter "i" for 1908. 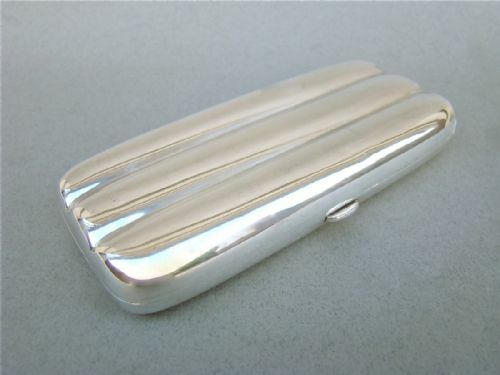 This unusual Victorian silver vesta case is of lobed rectangular form, resembling a cigar case. The plain fluted body with sprung hinged cover. S I LTD for Stokes & Ireland. Date letter "N" for 1894.